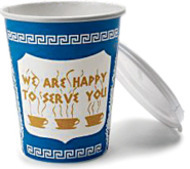 The designer of the New York City coffee cup died. I used to go into a diner on 43th Street every morning and ask for a "coffee regulah," which is coffee with milk no sugar. I would pull back the triangle and slurp it down by my computer leaving a half circle of lipstick around the rim. I rarely encounter a place where they put either milk or sugar in your coffee for you. It’s always self-help. Our Canadian version is “I’ll have a double double” which translated means two cream/two sugars. Speaking of Canadian coffee, I just don’t get what the big deal is about Tim Horton’s. The coffee was good, but it was hardly so good that I wanted to bring home a can so I’d never be away from it. The donuts were also good, but almost anybody can make sugar and grease taste good. MH: Tim Horton’s is one of those classic Canadiana places whose legend outweighs the actual quality. Lovers of “Timmies” are legion but you can do much much better in an independent coffee house. Coming from the West Coast of Canada, I didn’t grow up with it. For me, it’s the coffee I drink on the way to the cottage with a box of Timbits. When I was teaching English abroad, the local textbooks insisted on teaching the term “white coffee” for coffee with milk. In the late 1600’s coffee culture swept across Europe. Coffee houses sprang up, first for the wealthy, then for the students and intellectuals. These coffeehouses patrons came to exchange views and foster debate. Things haven’t changed that much over the years and coffee houses and a cup of joe are all that’s required to exchange views and solve the world’s problems. Our goals here are not quite so lofty. In the “Coffee House Magazine” we’ve compiled a miscellany of news & views about the coffee industry. Just interesting articles that we think you might be interested in while you’re enjoying that perfect espresso or cappuccino! The opinions expressed are those of the authors, of course, and not of Espressotec.